Best in class? Yes, but still far from perfect. True wireless earbuds are all the rage, but they either do too much or don’t do enough. If you want good battery life, you’re going to be sacrificing other features that might be useful to you. And if you go for the features, you’re giving up battery life. 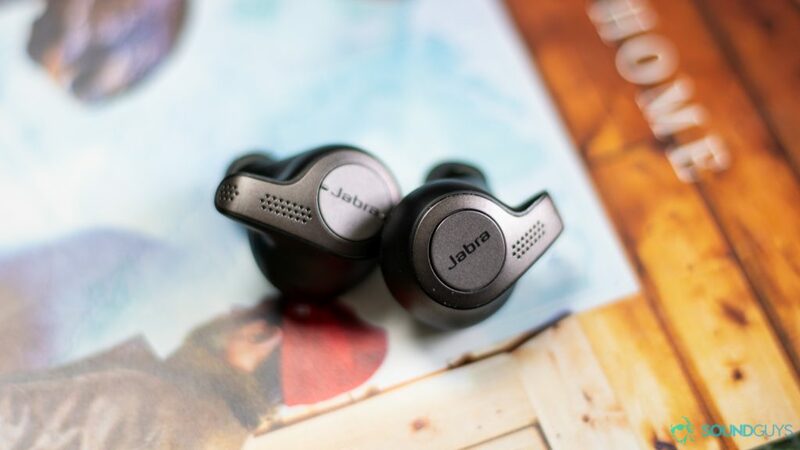 It’s hard to find one pair that checks all the boxes, but the Jabra Elite 65t get the closest. That said, they’re far from perfect. So even though they’re the best option currently available, there’s always room for improvement. Gadget enthusiasts. If you like having the newest gadgets made for convenience over sound quality, you’ll like these. People who take calls. The microphone on here is top notch. It’ll be clear that you’re not talking on your phone, but your voice will come through fine even in a gusty environment thanks to the wind noise-reducing microphones. Once you pair them, you never have to repair the Jabra Elite 65t earbuds. Just take them out of the case and they auto-connect. Like all of the true wireless earbuds currently available, the Elite 65t are made of plastic. So if you’re expecting a premium metal design, you’re going to have to keep waiting. The good news is that the plastic build means these are lightweight and don’t feel like they’re weighing down your ears. I was also really impressed with how well they fit. Normally, I feel the need to replace the ear tips with Comply memory foam ones for isolation and fit purposes. But the silicone tips that come with the ‘buds by default did a good enough job at both that I didn’t feel the need to. Whether I was walking around the apartment or running at the gym, I didn’t have them fall out of my ears once. The Jabra Elite 65t also have an IP55 rating, so you don’t have to worry about rain or spills destroying your investment… just don’t try swimming with them. Although I used them at the gym twice, I’m not entirely convinced that they’ll be fine after months of corrosive sweat. Design-wise I actually really like the way these earbuds look. They’re a little closer to the vision I have of humanity in the future where everyone is wearing little wearable earbuds like in the movie Her (which I am so down for). Each earbud has a button responsible for controlling different aspects of playback. Although I see them all the time, and they seem to be exploding in popularity, I still think Airpods look ridiculous. The Jabra Elite 65t look more discreet and, in a weird way, a little more professional. I feel less like a hypebeast wearing these out in public. There’s also a small part at the bottom of each ‘bud with microphones inside, and since Jabra has a long history of making microphones for in their headsets, I’m not surprised that these work well. On either earbud is a button that lets you do certain things like change songs and adjust volume, but what I like most about them is how much surface area they cover. The left earbud actually has two different buttons, each with a small ridge that lets you feel where to press. Now it may be because I have little dainty fingers, but I have no problem getting an accurate click on the button I intended to press and never accidentally hit the wrong one. They aren’t the most tactile buttons I’ve ever used, but I think that’s a good thing. If they’re too click-y, then you get a suction effect in your ears every time you want to adjust the volume, which can get uncomfortable really fast. This is a problem that I had with the Jaybird Run, since the buttons were too stiff for my liking. The Elite 65t earbuds have great microphones for calls, and when you’re done just pop them back in the case. As far as connection goes I was disappointed in the Elite 65t. They were good, but that’s about it. Drops were very rare, but they did happen despite them using Bluetooth 5.0. In a four-hour time span, the music stuttered twice, which isn’t bad at all but I still have to mention it. I can understand if I’m across the room, but if my phone is in my pocket, I don’t think it’s too much to expect no stutters. Beyond that, there’s a significant lag in audio when watching videos on your phone. Because there’s no low latency codec, dialogue doesn’t match up with what a person is saying. This became more or less noticeable depending on what I was watching. Obviously, this isn’t a problem if you don’t watch a lot of videos, but if you spend your commutes catching up on your favorite shows or YouTube channels then it’s something to be aware of. While we’re on the topic of negative connection issues, my pet peeve is that these don’t have a high-quality Bluetooth codec. They max out at SBC, which if you know anything about Bluetooth codecs is the base standard. So basically, they don’t have any kind of high-quality streaming option available. The Elite 65t earbuds aren’t large and bulky, making them a nice everyday pair of ‘buds. On the bright side, I love that once you pair them to your phone you almost never have to do so again. Every time I open the charging case and remove the earbuds they automatically pair to my device before I even get them in my ear which is impressive. The same is true when I put them back in the case. I don’t have to turn them off or do anything extra besides take them out of my ear and place them back in the case for them to automatically disconnect. It’s a small thing that makes a big difference, just ask anyone who uses Airpods. It’s one of its best features. These are also better than the Airpods in that they actually have built-in playback controls. The left earbud lets you control volume by clicking left or right, and you can also skip between tracks by holding down the two buttons. The button on the right earbud pauses or plays music, and if you hold it down, you’ll activate your phones personal assistant like Siri or the Google Assistant. This is one area where these earbuds excel and is one of the main reasons we had no problem recommending it on our best true wireless list. We spend a good portion of our time trying to objectively test the performance of headphones and speakers here at SoundGuys, which includes battery life. As you can imagine, accurately testing how long a product lasts can take up a lot of time. Thankfully (not so much for him), executive editor Chris Thomas makes sure each product is put the same tests. In the case of true wireless earbuds, this means having them set to an output of 75dB(SPL) and playing music on loop for hours at a time until the battery is drained. 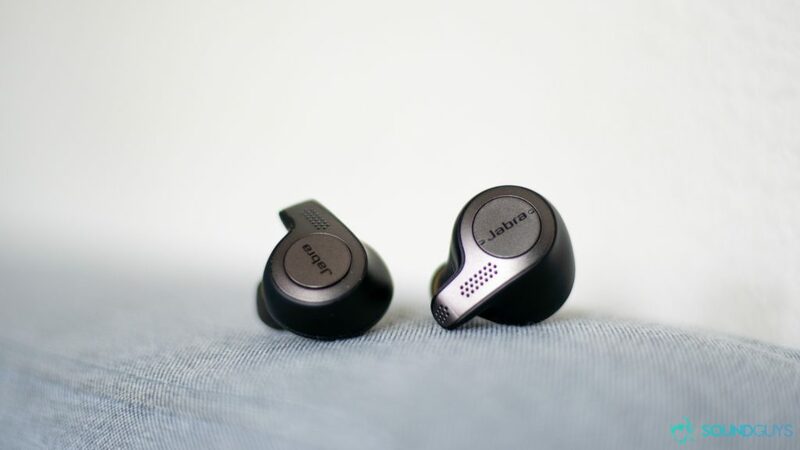 You can learn more about how we test by clicking here, but in the case of the Jabra Elite 65t, we found that they had the best battery life out of any true wireless earbuds we tested to date at 5.8 hours of constant listening. That’s not including the charging case, which can give you an additional 10 hours of battery life. And if you’re running short on time you can quick charge the ‘buds in the case. Charging them for about 15 minutes will give you 1.5 hours of playback. The charging case adds an extra ten hours of battery life and is small enough to fit in your pocket. Let’s start off with what I like about these ‘buds, which is the microphone quality. Just listen to how clear my voice is at about the 05:30 mark in the video. Even though I’m talking through the Jabra Elite 65t in a completely different room and standing about three inches away from my AC with it on full blast, you can still make out every word I say, which is impressive. Unfortunately, I’m not that impressed with sound quality. The Jabra app lets you go through a few EQ presets, but I found it didn’t really matter because of the lack of higher quality streaming. They don’t even do AAC from iOS devices. So the low-end in the song Night Air by Jamie Woon was almost non-existent. If you’re a basshead, the Elite 65t earbuds aren’t for you. It’s not fair to expect too much out of drivers so small, but notes that fall below roughly 300Hz are hard to make out at all. I’m used to the rolling bass throughout the song really weaving its way through the track, but here it drops out at times. Things get a little better when it comes to the mids as that’s where vocals lie. Due to the lack of emphasis that’s put on the lower notes, instruments are easy to pick out and separate even if they’re lacking detail. Notes in the highs don’t sound any better and high volumes can introduce some annoying distortion. You can hear this at 0:58 into the song Horchata by Vampire Weekend. When all of the instruments come in together, the bells and cymbals all but disappear as the snare drums just completely take over (not in a good way). The Elite 6t earbuds have great microphones for calls, and when you’re done just pop them back in the case. A small LED indicator lets you know when the earbuds are charged. Once you pair them, you never have to repair the Jabra Elite 65t earbuds. Just take them out of the case and they autoconnect. Should you get the Jabra Elite 65t over the Airpods? It’s worth mentioning that you probably aren’t investing in a pair of true wireless earbuds for the sound quality. If what you’re after is the same thing that people like about Airpods, like auto-connection, great battery life, and good microphone quality, then these will be right up your alley. They even do a little better than the Airpods when it comes to playback controls thanks to the buttons on each earbud. 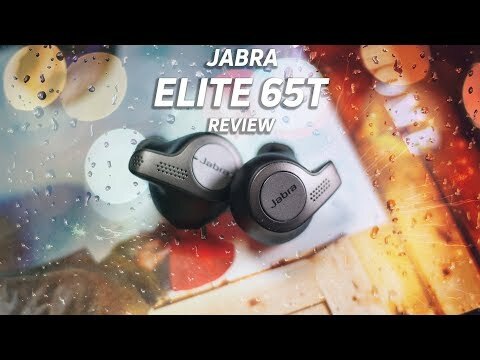 But despite them meeting or exceeding features that people have come to like about Airpods, the Jabra Elite 65t are just as bad when it comes to sound quality. They get a slight edge just because they actually sit in your ears and passively isolate outside noise, unlike the Airpods which basically have no isolation at all. I have no problem recommending these over the Airpods, but if you don’t mind having a wire there are plenty of Bluetooth earbuds that sound way better for the price.